South Sydney star Dane Gagai has opted to play for the Maori All Stars side rather than the Indigenous team in a move sure to add further interest to February 15 clash at AAMI Park. Gagai, who was eligible for both teams, represented the Indigenous All Stars between 2015-17 but has chosen to represent another side of his family heritage in the revamped fixture. Fan voting for the two sides that will take part in the Harvey Norman All Stars clash opened on Tuesday, with the NRL asking fans to have their say before coaches take that advice on board and select the two teams that will play for the Arthur Beetson Trophy. NRL Senior Manager of Indigenous Strategy Mark Deweerd said voting is a great way for fans to be involved. "The All Stars event is as much about the community as it is about the game itself," Deweerd said. "The chance for fans to have an input into the selection of the teams is the only opportunity across the game that allows fans to vote for who they want to see play. "As the teams will spend the week engaging with the local community, it would be great to see both the Victorian community and the broader population get behind the game, to not only celebrate a great game of football showcasing wonderful talent, but enjoy the cultural experience it has to offer as well." Be sure to witness a marriage of cultures, history and community on the field for one night only. Welcome to the official NRL Harvey Norman All-Stars Fan Voting portal. Vote for your favourite eligible players ahead of the 2019 clash at AAMI Park on Friday February 15. 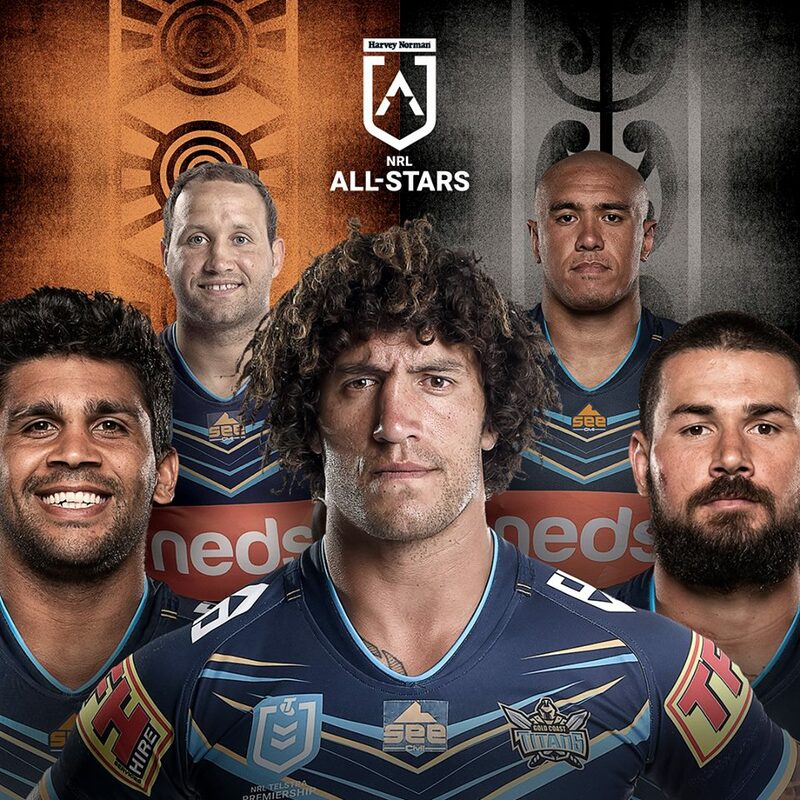 The Indigenous All Stars clash with the New Zealand Maori makes me excited but also nervous. As a fan, I am always excited by the Harvey Norman All Stars game. As a former player I also get the closest feeling to pre-match nerves, as I would love to be able to pull on the boots one more time. Hopefully the players will feel the same as pre-match nerves always suggest the boys are geared for a big performance. This historic game against the Maori in Melbourne has special significance for me as the "Welcome to Country" game in 2008, which was the driving forced behind the All Stars concept. The Maori team had the same special connection to their people and culture that made the game a highlight of the careers of all the players involved. However, the real inspiration came from engagement with the community across the week, where we were mobbed by supporters of the team. Johnathan Thurston and Greg Inglis were among members of the Kangaroos team who joined us on a number of occasions and they were envious of the opportunity we had. JT and GI's desire to play for their mob helped drive the case for the All Stars. It is a desire reflected in the decision of Latrell Mitchell to request to play in the game and miss the opportunity to play in the World Club Challenge in England. "I can't wait to get amongst my culture and to rip in and represent my people in the All Stars game, and then go into the season fresh and ready to play for the Roosters," Latrell said. "I know the Roosters boys are ready to go to England and rip in. I have spoken to a few of them and they have told me to go and represent my culture so I'm pretty happy with the decision I made." Full marks to Trent Robinson and the Roosters for supporting Latrell. In 2008 I described my appointment as captain of the Dreamtime Team as the equal of any of my achievements in the game. To this day it has only been matched by being named as the captain of the first All Stars team. I know that winning a premiership is every player's dream, but to represent your people is an honour that all the boys were proud to achieve. It is also a great opportunity for relatively unknown players to make their mark. In 2008 the Maori had youngsters by the names of Kevin Proctor, James Tamou and Jordan Rapana in their team. Kevin and James return as seasoned international players and I still have images of a fearsome Proctor in the famous pre-match war dances performed by both teams. This is why I am excited by the opportunity for Dragons prop Josh Kerr, who has been named as the Ryan James's replacement. As disappointed as I am for Ryan I can remember when he travelled to Brisbane for the 2011 team announcement. He expected to be picked as part of a development squad being named by Laurie Daley. Although a university graduate, Ryan obviously couldn't count as there were only 20 players at the announcement and he was surprised, shocked and delighted when Laurie called out his name. His performance against a powerful NRL All Stars pack established him as a star of the future. Now the Gold Coast Titans captain, he was selected in the squad to play the Maori Kiwis on February 15 at AAMI Park but withdrew due to a knee niggle. It will hopefully provide the same platform for Josh, who is a proud Ngugi, Noonuckle and Geopul man of the Quandamooka nation of Stradbroke Island. Josh will be immediately welcomed into a team by a connection of pride in his family, his mob and his culture. The same as the pride that motivated Latrell in his decision. It is this pride that is still at the centre of All Stars. It is a pride that is also shared by the Maori team. It is a shared pride that can take the All Stars to the next level. I am excited ... and nervous! HISTORIC SELECTION: Maori All Star Dane Gagai plays for the Indigenous All Stars in 2017. A WISH to simply please his mother led Dane Gagai to creating what may become a piece of rugby league history at AAMI Park on Friday night. The first All Stars pre-season NRL game between Indigenous and Maori teams has seen Gagai become the first man to be selected as a representative of both Indigenous and Maori teams. The Queensland State of Origin three-quarter’s mother, Tania, comes from a Maori family. Gagai will oppose seven former Indigenous teammates he played alongside when the NRL’S All Star concept was last aired two years ago. When the Indigenous side beat a World All Stars selection 34-8 in Newcastle in 2017, Gagai’s teammates included Blake Ferguson, Latrell Mitchell, Nathan Peats, Andrew Fifita, Leilani Latu, Tyrone Peachey and Bevan French. All will be on the opposite side to Gagai on Friday night. If the Indigenous-Maori line-up takes root as a successful option for the NRL’s All Stars project after Friday’s match in Melbourne, the Mackay-born star will prove a crucial figure in its success. Gagai’s father Ray, a son of two Torres Strait Islander parents, was also born in Mackay. “My mum was born in New Zealand. She was stoked when I made the decision,’’ said Gagai who scored a try for the Indigenous team in both the 2016 and 2017 All Star games. Gagai elected to play for Australia at Test level as he was born and raised in Queensland. Queensland clubs have supplied Jordan Kahu (Broncos) and Kevin Proctor (Titans) to a Maori side who yesterday named Warriors and Kiwi prop Adam Blair as captain. They have sent Titans pair Peats and Latu and Broncos trio James Roberts, David Fifita and Kotoni Staggs to the Indigenous All Stars camp. He was the man an entire community looked toward for inspiration and now Preston Campbell has nominated the NRL star he believes can be the next Indigenous leader. The driving force behind the establishment of the All Stars concept in 2010, Campbell passed on the leadership mantle to the likes of Johnathan Thurston and Greg Inglis when he retired, men who have had as much influence within the community as they have within the confines of a football field. But with the retirement last year of Thurston and Inglis announcing that season 2020 will be his last, there is a void that will soon need to be filled; Campbell believes Titans captain Ryan James has the requisite qualities to do it. A knee injury suffered at training two weeks ago will prevent James from taking his customary position in the front row for the Indigenous All Stars team that will face the New Zealand Maori in Melbourne on Friday night but he will join the camp on Wednesday to take part in community activities. Highly regarded for the work he does within the Gold Coast community, James last year won the Ken Stephen Medal and at 27 years of age is the one Campbell would like to see assume the position that Thurston and Inglis have both held. "Without putting too much pressure on him, someone like Ryan James, he is one guy that I would like to see standing up in front not just leading our people but bringing people together,” Campbell told NRL.com. "He's a good example of the type of person we need. "There are many out there but Ryan has done enough now to have that standing in the community. "We're going to miss guys like 'JT' and 'GI' but Ryan's journey has been uninterrupted, and that's something that's pretty rare these days for people with a high profile. I call it 'staying above the line' and he's lived that. A four-time Indigenous All Stars representative, James was agonisingly close to making his Origin debut in 2018. He knows he doesn't yet possess the resume on the field that Thurston and Inglis amassed but is passionate about leading the next generation of Indigenous players in making a difference. "Before JT retired they were two of the top five players in the world. It would be hard to step into one of those roles being the calibre of player that they are but if I can do it I'll do my best," James said. "It's something that I like doing, being part of the community and giving back. It wouldn’t be uncomfortable for me to do and if I was able to do it I’d love to do it. "That’s what this week is about, trying to get everyone together and be part of it." Players such as Latrell Mitchell, James Roberts, Josh Addo-Carr and Tyrone Peachey all made their Origin debuts in 2018 and James believes natural leaders will emerge over the course of the week. "They might not see themselves as leaders just yet but they'll realise over the next couple of weeks that they have to stand up and become a leader," James said. "Guys like Latrell, Jimmy Roberts, Josh Addo-Carr, Blake Ferguson, they've all played at the top level and even guys like Ash (Taylor) and Tyrone (Roberts). "Obviously Andrew (Fifita) is a leader as well. He played at Origin level and played for Australia and Tonga so he's respected by everyone. For Campbell, the example set by James is one all players would do well to follow. "We need to look at some young men that are not only good athletes but are really good people. Ryan is one of those fellas," said Campbell. "Having guys like him out front, these are the people we need our young people to see. Not only Aboriginal and Torres Strait Islander people, all people in Australia." GOLD Coast forward Kevin Proctor has promised there will be no holding back on his Titans teammates in what could be a fiery NRL All Stars encounter on Friday night. Proctor will represent his heritage by starting in the second-row for the Maori All Stars; opposite him will be indigenous club teammates Nathan Peats, Tyrone Peachey, Tyrone Roberts and Leilani Latu. “It’s always good playing against teammates and especially in a game like this, this will be a pretty heated exchange I reckon because we have got two proud cultures going at each other,” said the 29-year-old. Proctor, who grew up in the Maniapoto region on New Zealand’s North Island, hailed the fixture as a “special” occasion. “I get to represent both sides of my family,” he said. “Both my Mum and Dad are coming down for it so it’s going to be a good night. “This game is so special because we get to embrace our culture and be amongst it a bit more. After consecutive off-seasons disrupted by injury – knee in 2017 and throat last year – Proctor is glad to currently be fully fit and hopes the All Stars clash can set up his season. “It’s a big year for me,” said the former Palm Beach Currumbin High School student. “I’m feeling really good, especially with our new conditioning coach there, Dan Ferris, he’s really getting the best out of me. The match will kick off at AAMI Park, Melbourne, at 7pm (Qld time). LAURIE Daley’s Indigenous All Stars will employ a cavalier approach to tomorrow night’s season-opening match against the Maoris in Melbourne which will honour the freespirited Aboriginal approach for more than 100 years. The Kooris from NSW and Murris from Queensland will combine in an Indigenous side, who plan to showcase 80 minutes of exhilarating, left-field football. “We will look to be adventurous with the ball, showcase our skills and to play a little bit different to what you would normally see, a little all over the place,” coach Daley said. It would appear on paper that the Indigenous pack is a little light-on, prompting Daley to push a few outside backs into the backrow. Those players will include Melbourne’s Will Chambers, Newcastle’s Jesse Ramien, Brisbane’s Kotoni Staggs and Titans recruit Tyrone Peachey. GOLD Coast forward Kevin Proctor has promised there will be no holding back on his Titans teammates in what could be a fiery NRL All Stars encounter tonight. “It’s always good playing against teammates and especially in a game like this, this will be a pretty heated exchange I reckon because we have got two proud cultures going at each other,” the 29-year-old said. Proctor, who grew up in the Maniapoto region on New Zealand’s North Island, hailed the All Stars fixture as a “special” occasion. “It’s something that we don’t get to do that often being over in Australia. After consecutive off seasons disrupted by injury – knee in 2017 and throat last year – Proctor is glad to be fully fit and hopes the All Stars clash can set up his season. The match in Melbourne kicks off at 7pm (Qld time). Tune in to watch our 5 players in the All-Stars. Tyrone Roberts sets one up with a double pump and long ball. Everyone looked good. Latu not so much, Peachey will be huge for us and Peats is looking sharp. All Stars founder Preston Campbell believes the concept should be taken to New Zealand after the success of Friday night’s historic match between the Indigenous and Maori teams at AAMI Stadium. The clash, won 34-14 by the Cody Walker-led Indigenous team, was the first time the two cultures have met since the introduction of All Stars in 2010 and the inclusion of the Maori took the concept to a new level. NRL officials were happy with the crowd of 18,802 for the opening fixture of the 2019 season in Melbourne but it has always been intended that the All Stars concept would be taken to different communities around Australia and Townsville has been mentioned as a likely venue next year. However, Campbell said New Zealand should also come into consideration after witnessing first-hand the passion of the Maori players and supporters for their team. "Melbourne has been pretty successful tonight but if the Maori are involved again I would love to see it go to New Zealand as well," Campbell said. "I think you would pack stadiums out over there. "The night itself has been great but the whole week has been enjoyable. If you ask the Maori boys they would want to do it every year. It looks like you may be using adblocking software to view this site. Many features on the site, such as video playback, may not work properly when using adblocking software. Please whitelist our domain or disable your adblocker to access all features and videos. "They have been very appreciative, they have been saying thank you but I think we need to thank them for showing us what culture should be all about. The way they celebrate it is quite powerful and I am so happy for them." Maori All Stars coach Stacey Jones said there would be strong support for the concept in New Zealand. "I reckon it would be massive, it would be huge." Jones said. "I know that people would get right behind it when you have got two talented football teams. "People want to see class players play and I am sure they would get right behind it. The week has been more than just a game of footy. "The brotherhood out on the field after the game was very strong with both teams. We embraced the concept and know how much it means to them, and they know how much it means to us as well." When Campbell first took his idea for the concept to Gold Coast Titans CEO Michael Searle after the 2008 World Cup, he intended for the Indigenous team to play the Maori, but to gain widespread support the NRL All Stars were established. Wayne Bennett's commitment to coach the NRL All Stars against the Indigenous team and the backing of Darren Lockyer and Cameron Smith gave the concept instant credibility but support has waned in recent years after the introduction of the Auckland Nines. Bringing in the Maori team, whose clash with the Indigenous Dream Time team as a curtain-raiser to the 2008 World Cup opener was the only time the two sides had previously played against each other at full strength, has reinvigorated the concept and it appears to be here to stay. "I know a few key players pulled out at the last minute but the reason it will always work is because of the passion of the players," Campbell said. "They aren't going to go out there and go soft." Australian centre Latrell Mitchell gave the All Stars clash new-found credibility when he chose to play for the Indigenous team over a trip to France and England with the Sydney Roosters for the World Club Challenge. Mitchell was given the honour of leading the war cry while Campbell played didgeridoo. Maori captain Adam Blair led his team in a powerful Haka and they had expected to be too strong in the forwards for an Indigenous team which was forced to blood untried St George Illawarra forward Josh Kerr due to the unavailability of Ryan James, Wade Graham and Jack Bird. In contrast, the Maori team had New Zealand Test forwards Tohu Harris, Corey Harawira-Naera, Joseph Tapine and Kenny Bromwich on the interchange bench behind a starting pack featuring the likes of Blair, Jesse Bromwich, James Tamou, Kevin Proctor and James Fisher-Harris. However, the Laurie Daley-coached Indigenous team played the only way they could with the forwards available and relied on an expansive game play to overcome their bigger and more experienced opponents. The tactics proved successful with Melbourne and NSW Origin winger Josh Addo-Carr crossing in the 10th and 13th minutes to grab an early lead and the Indigenous All Stars then turning their focus to the right edge. Bevan French, who counts Preston Campbell and Nathan Blacklock among his relatives, scored a sensational try in the 32nd minute after finishing a length of the field movement started when Andrew Fifita created a hole for Jesse Ramien, who kicked ahead for the Parramatta speedster. In between, Dane Gagai – a veteran of three previous All Stars matches with the Indigenous team – grabbed his second try for the Maori, whom he had chosen to play for in recognition of his mother's heritage. Eels star recruit Blake Ferguson gave the Indigenous team a 20-10 lead at halftime when he crossed on the right wing and attempted a back-flip like Blacklock and Anthony Mundine were renowned for during their days with the Dragons, but he didn’t quite nail it and landed awkwardly. Everything else went right for the Indigenous team and boom Broncos forward David Fifita, who turns 19 next week, put Daley's team ahead 24-10 when he crossed in the 42nd minute. Tries to Walker and Kerr sealed the 34-14 triumph.